There are many vests which are based on the so-called wet evaporation principle: A vest is immersed in water and the water then evaporates relatively quickly. Another disadvantage: The dog and the vest are totally wet. Unfortunately, these do not work adequately. The disadvantages of wet evaporative cooling are not present at the dry evaporation: Our cooling products consist of a patented material with three layers and remain 100% dry and cool up to 3 days non-stop despite the use of water. The service life is approx. 54,000 hours of cooling. - The slower a molecule moves, the colder it is. That is why ice forms at 0°C. For example, if you feel cold after a hot shower, the fast, warm water molecules detach from your skin and only the slower, cooler molecules are present. The warm outside air warms the water and begins to evaporate. The warmer the water, the faster the individual components (molecules) move and evaporate into the environment. 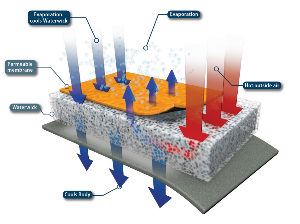 In dry evaporative cooling, the structure of our worldwide patented cooling membrane allows the fast, warm molecules to leave the vest quickly, leaving the slower, cooler molecules behind. This allows a unique cooling capacity to be achieved. The remaining water in the cooling vest or cooling mat cools down. The cooling removes heat from the material and the inner cooling layer releases the resulting coolness to the surrounding areas (dark). The outer layers of the cooling products become cooler and release this coolness to the dog's surface or prevent the ambient heat from hitting the dog's body. With the cooling vest, a kind of "heat protection shield" is created.